Leyla Kazim travels through Vietnam and discovers a wealth of noodle soups rarely seen outside the country, made with ingredients including sixteenth century well water and jellyfish. 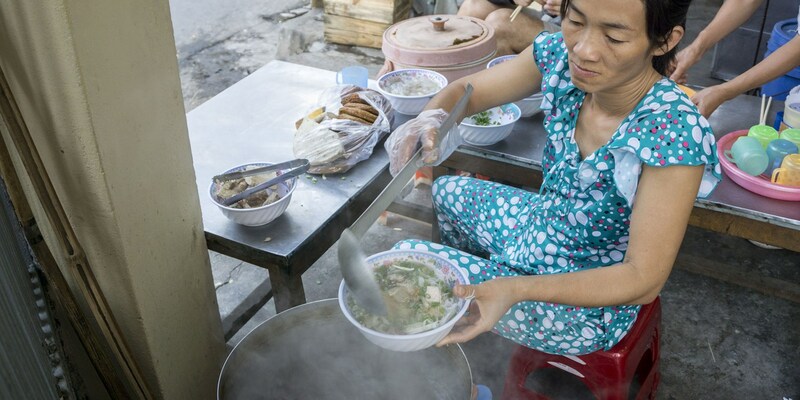 Every few feet in Vietnam you'll come across a cluster of locals crouched over steaming bowls of something good, perched on diminutive plastic stools that would barely accommodate one cheek of the average-sized western behind, and are a challenge to negotiate for anyone over five foot nine. These bowls usually contain noodle soup. The Vietnamese like to be outdoors no matter what time of year – people will occupy the pavements, gathered in groups close to the ground. If it’s cold, they’ll be wrapped up in coats, the rising steam from their dinner warming their faces. I don’t think I’ve ever eaten as much rice as I did during my five weeks travelling the length of Vietnam. Much of that was in the form of rice noodles, and they were usually in a broth. But I had pho just a handful of times. Most of the rest of my eating saw me getting acquainted with all the other regional noodle soups found throughout the country. Here are some of my favourites. 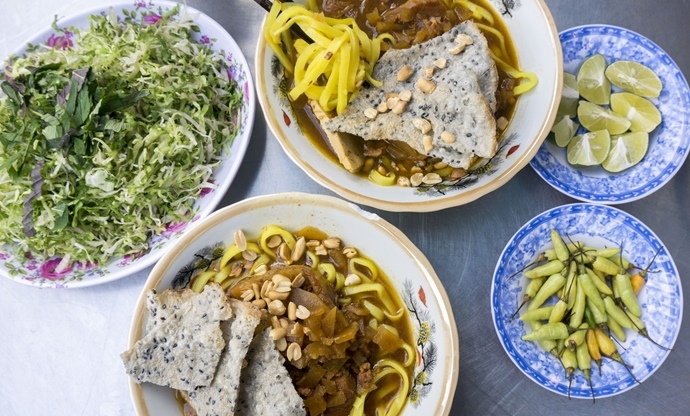 A dish you can only authentically find in Hoi An, as the noodles are made with water drawn from one of the town's five centuries-old square wells. The signature texture is the chewiness of the noodles, so much so you could be eating udon, and that reflects the Japanese influence. The key to that bite is soaking the rice used to make the noodles in a lye and well-water concoction, before being ground. Then there are thin slices of soy-simmered caramelised pork, crispy fresh lettuce, herbs, bean sprouts and the wide yellow-tinged noodles. It's finished with just enough meat broth to allow for a good slurp, and served with sweet and hot chilli jam and half a lime. This is sold all over the town. Look out for a street corner that's busy, and you can't go wrong. 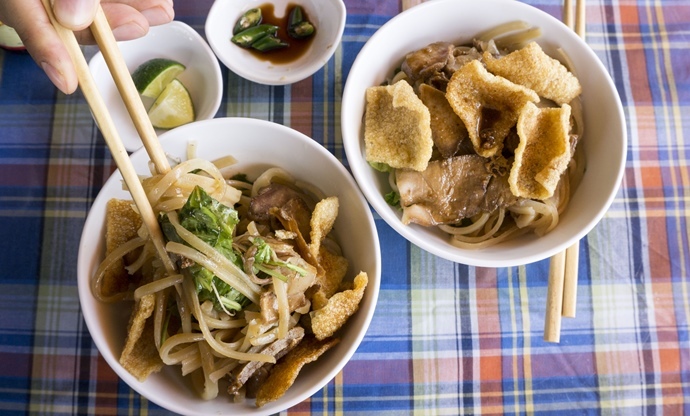 These bowls of noodles originate from the central region of Quang Nam, but you can find them across the country. 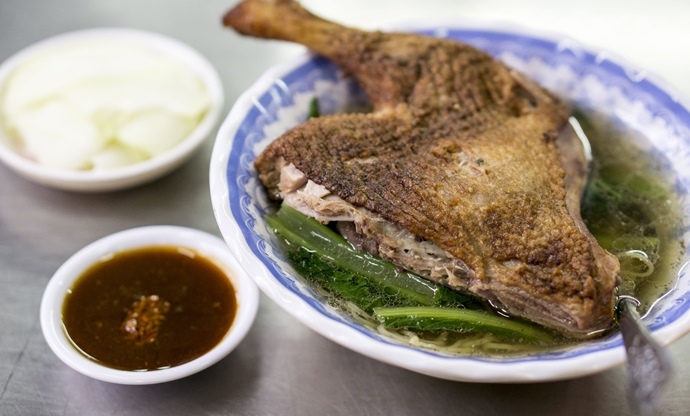 They sometimes come with great meaty slow-cooked pig trotters, just a little of the concentrated broth (often chicken, pork or fish-based, or a combination), finished with fish sauce, pepper, shallots and cu nen, a pungent garlic-like vegetable that's fried in oil for a rich, funky finish. The noodles will be stained yellow from turmeric, and extras can include hard-boiled quail eggs, crushed peanuts, cha (steamed pork sausage), herbs, lettuce, toasted sesame rice crackers and hot pickled chillies. Two good places to find this are Mì Quảng Thành, 58C Phan Đình Phùng Street in Da Lat, and Mr Hai, 6A Trương Minh Lượng in Hoi An. The Vietnamese word for jellyfish is sua, so be sure to stress that with lots of enthusiasm when ordering, for the real deal. 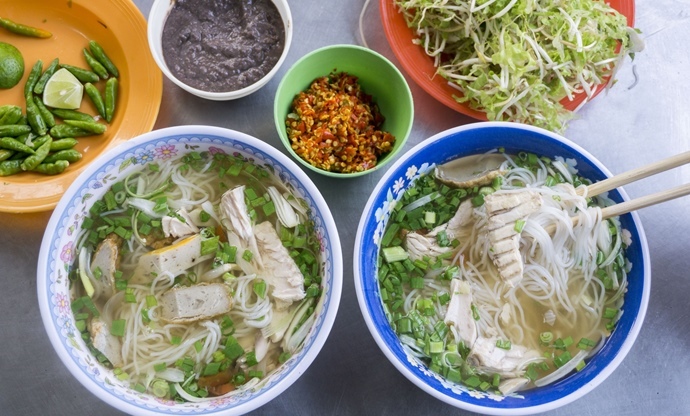 This rice vermicelli soup is native to the central beach town of Nha Trang. It’s a light dish with a transparent and delicate fish bone broth, white hunks of meaty local sailfish, tomato and shredded spring onions, served with fish paste, lettuce, basil and bean sprouts. This dish should also come with milky white jellyfish, the size of a thumb, caught off the neighbouring islands. But I only realised these had been omitted once I was halfway through the bowl; I suspect tourists tend to not enjoy it and so the owner left it out, just in case. A shame! The Vietnamese word for jellyfish is sua, so be sure to stress that with lots of enthusiasm when ordering, for the real deal. This Vietnamese favourite originates from centrally-located Hue, the seat of Nguyen Dynasty emperors and the nation’s capital from 1802-1945. The main difference between this soup and pho is that the latter is made with a chicken and beef stock, while the former is pork and beef. ‘People often expect bun bo Hue to be really beefy, but in reality the dominant flavours come from the lemongrass and pork trotters,’ Colin Tu, the owner of Vietnamese restaurant Salvation in Noodles, with branches in London’s Finsbury Park and Dalston, tells me. Accompaniments will usually include shredded banana blossom, crunchy bean sprouts, a punchy mix of garlic, ginger and chilli and fermented shrimp sauce. If you want full on authenticity, be sure your bowl includes the trademark cubes of congealed pig’s blood. 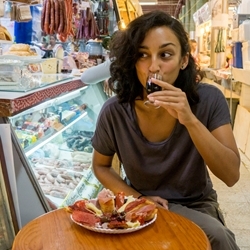 Think of it as a sort of spongy, steamed black pudding– it’s good. 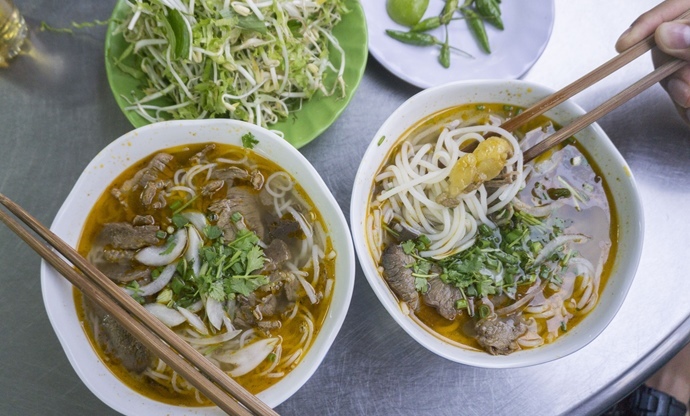 Two good places to find this outside of Hue (where it’s everywhere), are at 22 Phan Chu Trinh in Nha Trang, and Bun bo Hue Dong Ba, 110A Nguen Du in Ho Chi Minh City. In both cases, the owners are originally from Hue. If you would like to make your own, Colin Tu, the owner of Salvation in Noodles kindly provided me with his delicious recipe for Bún bò Huế. I stumbled across a bowl of this on my final day in Vietnam in Ho Chi Minh City, and what a way to bid the country farewell. This was quite different to any other noodle soup I’d had there, in that the meat was duck and the noodles were egg-based rather than rice. The bird is first marinated in garlic, pepper, soy, and Chinese five spice, the skin seared until golden brown, and the whole thing braised in a gently spiced stock until the duck flakes away from the bone. This was magnificent and very different to the flavours we’d been having; the Chinese influence was quite prevalent in this dish. You’ll find mi viet tiem throughout the city, but particularly around District 5. This one was had at Luong Ky Mi Gia, the eastern extreme of Phan Van Han street, at the busy junction.